I drove out to Contra Costa County to tackle a few easy summits as part of my local peaks month. The first half of the month I had done almost nothing while giving my knee a chance to recuperate, after which I've been doing some easy hiking and more strenous biking (which seems to impact the knee less). Today would be a hiking outing taking only a few hours. This ridge lies east of Interstate 680 in the community of Danville. Located adjacent to Sycamore Valley Regional OSP, Short Ridge appears to be private property, though it is not signed as such far as I could tell. It seems likely that it was once ranchland, now sold to developers or possibly a government agency's landbank. I approached from the north at the end of McCauley Rd, in a upscale Danville neighborhood. There is an unsigned gate here with a pass-thru to allow individuals but not vehicles. The pavement ends abruptly on the other side, leading to another fence about 100yds further. This one does not seem to be open for public use, but as the highpoint would be found on the other side, I went over anyways. I plied a recently plowed path (for fire supression, not agricultural purposes)up to the ridge where I found a firmer ranch road running across its length. I explored a short distance to the southeast before turning to the northwest and walking to the point identified in ListsofJohn as the highpoint. It's an odd sort of point though, as the ridge clearly continues to the southeast, climbing higher into the adjacent Sycamore OSP. In fact, the OSP has a route called the Short Ridge Trail which can be seen in Google maps, none of it actually landing on what the topo maps identifies as Short Ridge. But that would make the ridge about 3mi long instead of 1mi, so maybe the name Short Ridge would no longer be applicable - who knows? It doesn't really matter as the pursuit of 3rd order summits is rather silly anyway, I readily admit. At the identified point there is a lovely, large oak crowning the highpoint that by itself makes it a worthwhile visit. Mt Diablo can be seen in profile to the northeast along with a collection of Danville neighborhoods around this modest summit. I returned to the starting point about 45min after setting out. I next drove 3mi north to the Macedo TH at the edge of Mt. Diablo State Park. $6 self-pay is required to park in the gravel lot, street parking in the surrounding neighborhood restricted to permit parking only. The two named ridges are a short hike from the TH, though no trail goes to either summit. 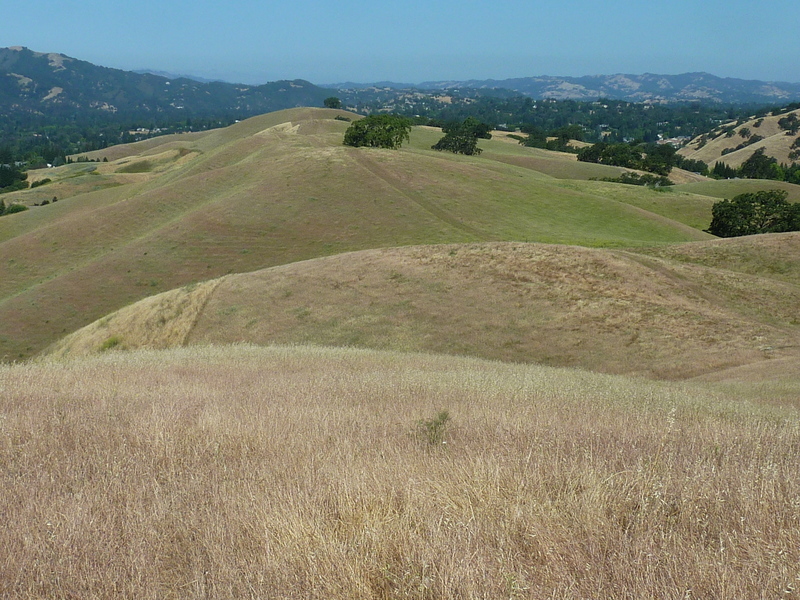 The Briones to Mt. Diablo Regional Trail passes by both of them and can be used to access the pair which are separated by a small tributary of Pine Creek. After depositing my fee, I visited Pine Ridge first, hiking up from the trail and across the non-obvious highpoint with several possibilities. My shoes collected stickers from the dry brown grass by the boatload. By the time I returned to the trail they had become so painful that I had to pause to remove the lot of them. I then followed the trail a mile to the northwest before climbing Shell Ridge, once again pausing for sticker removal upon returning to the trail. Kinda stupid to be climbing these sort of hills at this time of year, to be honest. The weather was pretty nice though, not too warm, and the park is lightly used in mid-week. Aside from a herd of cattle, the only other visitors were a hiking club I passed by on my return. I was back to the TH by noon, about an hour and a half all told. The Shell Ridge highpoint I climbed is NOT the same as currently depicted in ListsofJohn and Peakbagger.com. That point is a mile and quarter to the northwest along a lower extension of the ridgeline. The topo map shows 'Shell Ridge' in a larger font here and it has more prominence than the one I climbed, but otherwise I don't see how one can say it's the highpoint. Finding the highpoint of a ridge which often joins another, higher ridge, is in itself fraught with problems, but it makes for a good excuse to go visit a new place.